Date palm (Pheonix dactylifera L.) has long been known for its medical benefits. In this review, the therapeutic properties of P. dactylifera are presented in light of the analysis of huge past reviews that reported the bioactivities of both flesh and seed of this fruit. The reported bioactivities of P. dactylifera included antioxidants, anti-cancer, aphrodisiac, antimicrobial, and anti-diabetic properties. 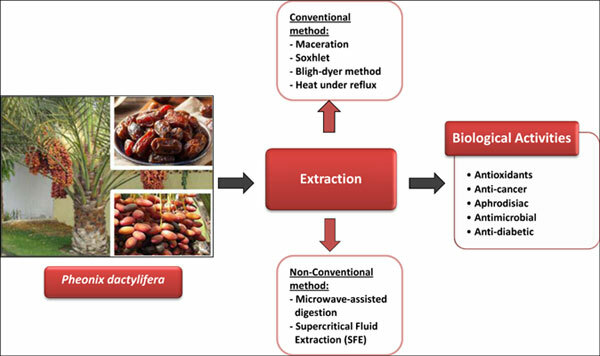 This review additionally highlights the extraction technologies (Soxhlet, maceration, heat under reflux, Supercritical Fluid Extraction (SFE) and microwave assisted extraction) that were utilized as part of the extraction of P. dactylifera. This is because the quality and amount of the extraction yield depend on the extraction technology used. Accordingly, this review aims for underlining the potentials of P. dactylifera by compiling available data on the bioactivities and extraction technologies used to set the directions for the improvement of future research of this fruit. Pheonix dactylifera L., bioactivity, antioxidants, anti-cancer, aphrodisiac, antimicrobial, anti-diabetic, extraction technologies, supercritical fluid extraction.